Discovering that my mom was experiencing changes in her body did not happen over night. In fact, before she was diagnosed, she had been experiencing symptoms for about a year. We believed it was just clumsiness. Looking back, the day that she broke her foot was when it all began. My mom was racing to get to the EPHS auditorium with her friend to see my sister perform in the talent show. She slipped on a piece of ice & broke her foot as a result. My mom wouldn’t be my mom if she didn’t sit through the entire show before realizing that something might be broken. After getting a cast she felt as if she was not healing properly. She eventually went back to work at Nordstrom, but didn’t feel quite right. Next she went to Mexico with my sister for her spring break. All throughout the trip, my mom’s foot felt weak & she was experiencing random tripping & falling. Apparently she & my sister went parasailing & my sister was worried the entire time about how they were going to land back on the boat. Of course my mom was not worried at all & had a great time. Leave it to Jenna to do all of the worrying. After Mexico, my mom headed back to work still feeling a little weak on her supposedly “healed” foot. Nordstrom was doing a large renovation at the time, and my mom ended up tripping on some torn up carpet & broke her wrist this time. Ugh! Because of the severity of the break, my mom ended up with a titanium plate in her wrist & then developed a staff infection. After being hospitalized & treated for the infection she was off to hand therapy. This is when we started to notice a drastic change. My mom was not getting the strength back in her hand that she had had before. She also began to have a hard time pushing herself off of the floor if she sat down. We blamed it on the wrist….but apparently other things were happening that we had no idea about. Around this time my sister was graduating from high school & my mom was planning her graduation open house/party. I had come home from North Carolina (where I was living at the time & between moves) to help her out. My mom seemed especially worn out & I thought that she just didn’t enjoy throwing parties. Anything involving creativity & planning was never especially loved by my mom…while I loved party planning! Don’t get me wrong, my mom loved to party though! I remember ending up organizing most of the party because my mom was so worn out. I distinctly remember one night when she asked me to look up the symptoms of MS. I thought that my mom was crazy. All of my life my mom was what you can call a “drama queen”. If we ever said we had an ear ache…she thought it was cancer. Etc. So, after a wonderful graduation party for my sister, I headed out to Boston which was my new home at that time. Over the next month or so, my mom really began to notice that her wrist was not healing. She was feeling off balance & the random tripping continued & became more often. At this point, she decided it was time to head to a neurologist. I remember getting the phone call from my mom saying that they were thinking she may have ALS. I had no idea what ALS was & immediately googled it. After reading the definition, I knew that my mom could not have that. What kind of a crazy idea was that?! So, while I was in denial, my mom headed to the Mayo Clinic with my dad for some extensive testing. Apparently the testing that they do is incredibly painful & emotionally draining. When all of the tests were done, the doctor came in and told my mom that it was undoubtedly ALS (commonly referred to as Lou Gehrig’s Disease). Looking back, I remember my mom telling me that the doctor was young & had a horrible bed side manner. He didn’t seem at all sincere or sorry about the completely life altering news he was giving my parents at the time. He even said that there was no use trying any alternative therapies or changing diet and lifestyle. He basically came across as “go home and get ready to die very soon”. When my parents got home, my mom immediately called me. I was hosting a party with my ex at the time & I remember getting that phone call…and my world turning upside down. I was half in denial and half completely destroyed/devastated. I couldn’t believe it. My mom had never been sick a day in her life. It just didn’t make any sense. After that day, I headed to work as usual, but found myself staring blankly at my computer screen. I sobbed & sobbed on my way home in my car. I basically became a shell of a person. I will write another time about coming to the decision to move home to help & all of the many challenges I faced personally & emotionally. One important thing I want to come out of this story was what a rock my dad was. He didn’t falter once. He said “we are going to do everything in our power to treat this disease and slow it’s progression”. Over these last few years we have tried and done everything. Some things help & some don’t at all. 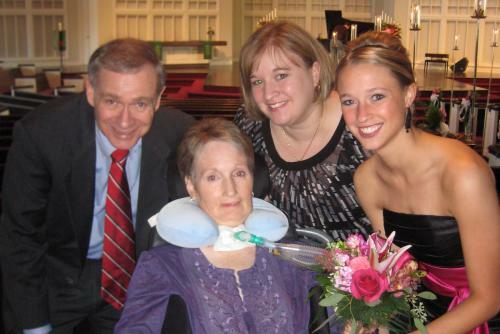 But one thing will always remain the same, we never give up the hope & believe that some day my mom really could be cured. We don’t live each day as if it could be her last. We live knowing that anything is possible & God is good. I am not going to say that it hasn’t been a really tough road. Because it has. It has been impossibly hard at times. But it has also given us wonderful times together as a family & proven that we will do anything for each other.